The focus will be on the British pound on Thursday for a number of reasons. There is a Bank of England monetary policy announcement on the calendar along with the Quarterly Inflation Report and a speech from Governor Carney. Additionally Prime Minister May will be publishing a White Paper containing her Brexit plan. We are not sure exactly what time her White Paper will be released but the monetary policy announcement and Quarterly report could be more positive than negative for sterling as the central bank is widely expected to increase its inflation forecast. Growth and inflation has been stronger than expected but the challenge for Carney is assessing how this could change in light of the government’s plans for a hard Brexit. The last time the BoE met, Carney said rates could go up or down in the months ahead. Brexit is quickly becoming reality as members of Parliament passed a bill today backing the trigger of Article 50. In May’s report tomorrow, she could outline a timeline for Britain’s exit from the European Union. 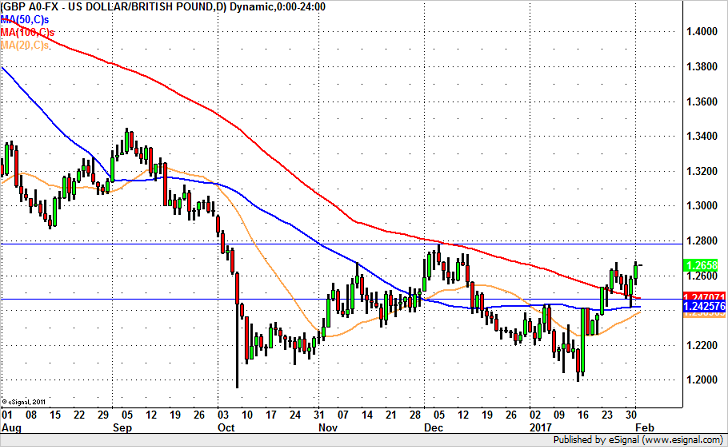 Its going to be a very volatile day for GBP/USD and the levels to watch will be 1.2775 on the upside and 1.2475 on the downside – if either of these levels give, we could see a much stronger move in the currency.